Many powerful people have discussed and described leadership. The hallmarks of leadership include creating a vision, establishing a direction, and demonstrating by example how to pursue the path. 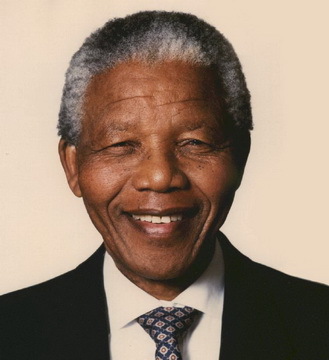 As I reflect on those I consider great leaders I think of people such as Nelson Mandela, Martin Luther King, and Mahatma Gandhi. Certainly they were vocal, strong in presenting and pursuing their visions and voicing their passion, most definitely important aspects of leadership. However, they each learned leadership through the crucible of life which honed and prepared them for their mission. They first had to lead from within, so that their integrity shone forth and their personal power established. Without first mastering themselves, and demonstrating leadership of themselves, they would not have had the same power to shape nations. Imagine spending over 20 years in a prison cell. The courage and the conviction required to abide the appalling conditions Mandela suffered enabled him to emerge as the statesman he is. Gandhi’s did not invent his ideas on nonviolence on a whim but as a result of years of struggle, including imprisonment, and demonstrated conviction to his values. Martin Luther King grew up with a full understanding of oppression, and knew it was dangerous to seek change, but had a vision, a dream, and was willing to back it. To achieve leadership greatness one must, I strongly believe, lead ourselves first and foremost through and out of our own darkness. All through our life we have built up layer upon layer of programming, training, behaviours, attitudes, beliefs, addictions, emotional responses, social expectations etc. These cover up and detract from our clarity over our life purpose and the values that are core to us. We establish protective mechanisms that keep us safe, maintain security and levels of certainty, but which also rob us of the ability to align with and act in accordance with our core purpose. Cutting through the façades we have built around our soul so we can shine forth in the fullness of who we are is a powerful process and requires deep commitment to self, and personal leadership. Success in this endeavour provides the substance for and basis of our personal power. It enables us to manifest leadership to others because we have triumphed within ourselves. Fundamentally it is pain and pleasure that motivates us to action. We avoid pain and seek pleasure, with pain taking precedence over pleasure. We grow up with experiences shaping our beliefs, attitudes, values and perceptions. We learn who we are and what behaviours are acceptable, and which are not, from our primary care givers. We associate pain with non-conformance, from failure to work within norms and social boundaries. We associate with groups (friends, colleagues, gangs etc) and learn of the rules for reward by these groups. Obedience to norms carries rewards. Breaking from the norms, being odd or different, carries penalty and pain. But a leader cannot work in the norm, as an average person, as part of the group. At some point they must assert themselves, separate from the group, and come into their own space. Most people start learning this as teenagers, rebelling from parents and choosing another tribe to belong to. They move from one social group to another, establish different patterns and norms, and feel they are closer to being themselves. Later they discover it was their desire to belong that motivated them so they were still being managed by groups. Some never get over this, looking outside themselves to satisfy their need for acceptance and belonging rather than from within themselves. When pursued further, the maturation process eventually leads us to question who we are, why we are here and what greater purpose we serve. The recognition of our individuality, our uniqueness, and the possibility that we have value enables us to seek within for our gifts. Discovering and being true to who we are becomes important. There is a shift from seeking love and acceptance from outside to a place where we provide that to ourselves, and become less bound to the whims of our “tribal” groups and roots. However there is also pain in this process. Shifting our focus from outside to inside us requires us to meet and confront all our fears, insecurities, debilitating attitudes and behaviours, and find ways of putting them behind us. Some of us have powerful inner critics that berate us as our parents may have. We hear the piercing criticism from within with greater clarity than the scolding we may have experienced in younger days, which can stop us in our tracks. Whether it is the voice of our inner critic or the rigid walls of protection we have erected over the years, they stop us shining, and to truly emerge we must overcome them. If we stay bound to our insecurities we shun the opportunity to change and to transform ourselves from part of the pack to the leader we can be. If we seek to change ourselves through coercion and internal aggression and anger we have simply substituted the voices of our experience with our own tormentor. We emerge when we have found ourselves to be lovable, acceptable and perfect as we are, and truly believe that. That is not saying we are perfect. Goodness, what is perfection and who can judge that? It is saying that we are entirely acceptable as we are, that we have our own uniqueness based on who we are and what we have experienced, and everything has brought us to this point in life, and all of this is perfect and right as is. To lead others we must lead ourselves. We must be able and capable of dealing with adversity, the naysayer, and find ways through and out of those difficulties. Our ability to deal with and manage external adversity and opposition is much greater when we have mastered the opposition that comes from within us. Our ability to lead with clarity and conviction in public is greatest when we have already managed that within ourselves in isolation. Perhaps being in prison for 20+ years is something that could benefit everyone. Certainly it provides time to reflect, see ourselves more clearly and deal with our personal demons. However not all of us need to change whole nations. We have good we can accomplish by remaining engaged in the world, but the battle within is just as real. A growing number of people are learning the benefits of meditation, yoga etc for stress relief. Some find it painful because they slow down a little and start to see themselves more clearly, and find things they judge as unacceptable or wrong with them. If we wish to lead others effectively then we must have already learned to lead from within. We must have confronted ourselves and been victorious in engaging with and being comfortable in the presence of our own voices and messages from within. We must have learned about tolerating and working through the issues that surface from our past. We can be hampered by insecurity and doubt or develop a powerful love of ourselves, warts and all. None of us can become entirely free of these things, but we can develop comfort for and appreciation of the fog we create in our lives, and find ways of charting through them. For as we move through our own internal fog we develop the capacity to lead others through theirs. Our deepest fear is not that we are inadequate. Our deepest fear is that we are powerful beyond measure. It is our light, not our darkness that most frightens us. We ask ourselves, Who am I to be brilliant, gorgeous, talented, fabulous? Actually, who are you not to be? You are a child of God. Your playing small does not serve the world. There is nothing enlightened about shrinking so that other people won’t feel insecure around you. We are all meant to shine, as children do. We were born to make manifest the glory of God that is within us. It is not just in some of us; it is in everyone. And as we let our own light shine, we unconsciously give other people permission to do the same. As we are liberated from our own fear, our presence automatically liberates others. The more we connect with ourselves, and manifest the greatness within, the greater our capacity to work through life, deal with issues, and exhibit personal power that will inspire others. If you wish to lead others, then first lead yourself. Where are you in the process of developing personal power and governing yourself? 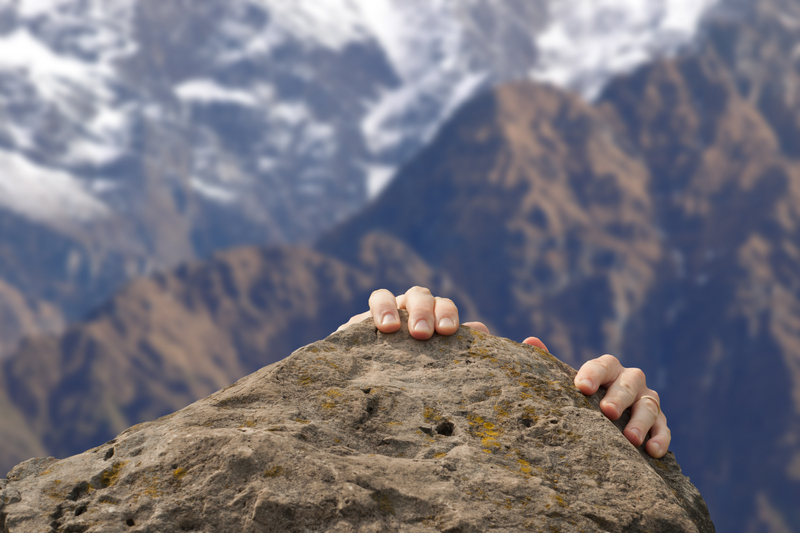 What barriers have prevented you achieving the success you desire? What behaviours and attitudes diminish your ability to lead others and create change within your organisation? As you learn to lead from within you also gain greater understanding of the issues and barriers faced within organisations and how to work through them. There is little as exquisite as achieving a stretch goal! Goals are important to planned success but are often half-heartedly approached or considered prepared when the end state is thought of an in the mind. Few individuals truly set goals in a manner that works. Even among the leadership of organisations and projects there is limited personal skill and success in goal setting. I assert that personal experience in goal setting and goal achievement leads to more effective project and strategic management. The better we are able to manage ourselves in inner leadership the better we can influence and affect positive change and results with others. To set and achieve goals it is essential we understand what we value. Energy, passion and commitment are accessible insofar as we align our goals with what really matters to us. Primary motivators in life include affiliation, power and achievement. These can have a significant impact on what we do. They are neutral regarding how we act. They are not at all inspiring. Inspiration comes from our values. They determine why we do things. They also affect the ‘how’ since they set limits on what we consider appropriate behaviour. Core Values are overarching operating philosophies we maintain regardless of how difficult circumstances may become. We typically have 3 to 5 such values. How clear are you on your core values? Do you know what you are not prepared to give up or relinquish in your quest for success in life? By clarifying our core values, some decisions are much easier to make. When we breach a core value we experience a loss of integrity, associated feelings of shame or guilt, regardless of whether we have identified the value or not. Avoidance Values: states (e.g. depression) or feelings (e.g. anger) we avoid. 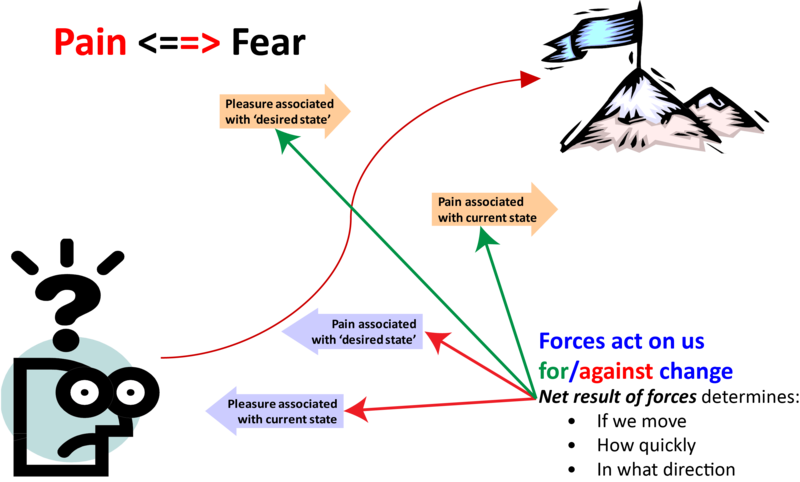 General Values are associated with two fundamental drivers behind all human action: seeking pleasure and avoiding pain. If an action may result in pleasure and pain of comparable magnitudes, we tend to avoid the pain by not taking action. They may also hold the key for personal conflicts we experience. I remember identifying personal growth and peace as two values I sought. I wanted peace in my life but I never achieved it. When I examined the rules for each ‘value’ my rule for personal growth excluded the possibility of peace as I had defined it. I realised I had to change my rules or my expected state. I did both and now have peace and growth concurrently. Our goals require us to take action, and action necessitates change. Change unsettles. It has to! It requires us to shift established patterns, beliefs, values, and cultural and behavioural norms. The degree of change determines the impact experienced. Change impacts on us via three sources of pain: breaking attachments, breaching protections and dashing expectations. Attachments (past) are our connections with established behaviours and relationships. Grief is pain experienced when we lose a family member. The pain associated with breaking a habit can keep us locked in. In a work environment, people have preferred patterns of work, ways they use systems, associates they enjoy working with, and some certainty in the results they can expect. They know what works, what does not, and have comfort through familiarity with where they are. Change these attachments at your peril! Protections (present) are established to bring us security and certainty. Whether performing routines with known outcomes, acting in habitual ways (even negative behaviours) because we want specific responses from others, or being in a physical environment that is familiar, our ‘protections’ provide security for us. Our belief system can be a special form of protective mechanism. To achieve meaningful goals we often must change self-limiting beliefs. Anything that disrupts our protections becomes a source of discomfort. Expectations (future) are aspirations that we have for the future. Examples include what our ideal partner is like, financial goals, the outcome of our next performance review, and who will be on our project team. Anything that causes our vision of the future to diminish causes pain. Expectations are attachments to the future. Pain is a real turn off from taking action. We have a natural (and reasonable) aversion to pain. Gaining pleasure is the reason we do take action. To be successful we must associate much more pleasure than pain with taking action. We must reduce the pleasure and increase the pain of maintaining the status quo, and increase the pleasure and reduce the pain associated with the desired state. The greater the positive difference between where we want to be and where we are, the better our leverage will be. The leverage we have determines how strongly we take action. Get clear about ‘Why’. Before starting work, get clear and specific about why you want to take action. Establish why it is vital that you succeed, what the change will create for you, and what you will miss out if you do not succeed. Specify what you will do and when. Plan the change. If this is a single step goal then this will include how, otherwise you need to map out milestones and time-frames so you can monitor and assess progress. This enables you to work on achievable chunks while maintaining a bigger picture perspective. Identify who will take action or be otherwise involved. This had better have your name next to it. You are responsible for your results. However, it is also important to identify those you need to consult and involve. Define ‘how’ each step will be accomplished. Get specific. The more clearly you define the tasks/steps, the better you are able to identify problems up front and ensure things are happening during execution. Assess pleasure and pain of taking action. This equates to risk management at a personal level. Identify the forces operating for and against change. Consider approaches that enhance the pleasure and reduce the pain associated with achieving the goal. Write down the goals and the plan for achieving them. This ensures the goals are not whimsical. The planning process helps internalise goals. Passion, energy and creativity is then accessible. Overwhelm the pain that prevents action with the pleasure associated with successfully accomplishing your goals. If you are working on relationship goals the process of working with your partner and getting specific about what you seek and how you will accomplish it brings the energy and commitment of two people more clearly to bear, with fewer assumptions and miscommunications causing havoc and upsetting the process. Getting clear about what pain and pleasure is associated with the change will place you in a better position to support each other through the individual struggles you will experience. The concepts are easy. The practice is not so easy. If you associate pleasure with planning and goals setting, it may become a powerful ally in your life. Overcome the resistance that impedes change. Decide to make your time on this planet count. These principles apply to relationships, projects and organisations so any success at the personal level supports you in other environments. While sitting in a project kick-off meeting I listened to a senior manager introduce a new project. He set the scene by telling us that we had 10 weeks to accomplish the project, that he wanted a premium result, and that any deviation from the perfect solution must be detailed in papers that explained the reasons for failure to deliver the outstanding result. It was the integration of a supplier’s system with their own. This had only just been completed with another supplier who had a more advanced environment, and it had taken 18 months. The team were clear that what was being asked was not possible. The manager was clearly ignorant of how the system and business operated, and arrogant enough to believe that saying it must be so was sufficient. It was an unhealthy way to commence a project. The team did achieve significant outcomes because of lessons learned from the previous experience, but by no means the ‘perfect solution’, and these were driven by the team’s own interest in realising the best result possible, and not this manager’s erroneous pep-talk. While the above story is based on a particular event, it is not unique. All too often project teams are placed in situations where they swallow the bitter pill of stressful time-frames, unrealistic expectations, and unnecessary pressure. They judge their management as out of touch with the reality of their organisation and as having failed to take early action in what was an obvious, prudent and timely fashion, and who then speak platitudes in an attempt to solve their own ineptitude. From the outset of such projects there is already an environment of distrust, conflict and blame which undermines the natural desire and motivation of people to perform their work in a satisfactory and fulfilling manner. Compare this “normal but unsatisfactory” environment with the following experience. 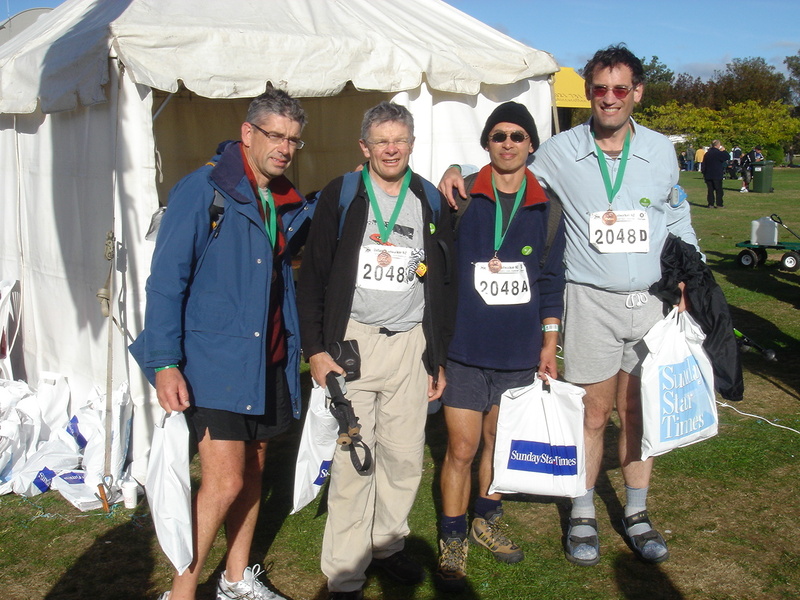 In March 2007 I did the impossible, or so I had been told by a number of people who knew me, successfully walking 100km (62 miles) in 25 hours 4 minutes as part of the Oxfam Trailwalker Challenge. For years (at least 20 years) I was a desk potato. I sat behind my desk, worked on my computer, and “prided” myself in having a body that mostly did what I needed without any maintenance. Over time its capacity diminished due to my lack of fitness apparent through tiredness, shortness of breath, and unresponsive, easily injured muscles. Six months earlier I first heard of the Challenge. Within 60 seconds I had volunteered myself on to the four person team. I was more than surprised at my decision. Something unfamiliar within me took over. Time for a change. I was part of an endeavour with others relying on me. Though a team event it was not a relay. We all had to complete the entire distance together, and I was the weakest link. My team mates included a marathon runner, an actively competing cyclist, and a mountaineer. On electing to participate one of them made the comment: “You know your own body.” Never a falser word spoken. I had no clue about my body, but something had called me and I felt compelled to answer. My busy schedule, always too full previously for exercise, suddenly changed. Training was undertaken. I struggled with 3–5 kilometre walks, pulling muscles on a regular basis. Anger and frustration were common feelings. My body did not perform as I demanded. It rebelled. Then I started to listen to it, dialogue opened up, and I sought outside advice. New shoes were tried. I defined regular training routes, distance goals, and I partnered with my body so we better supported each other. After a month I walked over 10km and I felt totally wiped out by the effort. At just under three months, the week of Christmas, I achieved a goal of exceeding 70 km within one week, including a 20km walk. A month later I walked a marathon. Serious pronation required specialist shoes. Blisters halfway through a 40km walk took 4 weeks to heal – wrong specialist shoes. My knees gave out under the strain of carrying me the distances being asked. However, I got to the event with the issues resolved and in the best shape I had been in since I was a teenager. As a team we ran over the finish line together. I felt a wonderful sense of accomplishment. What got me through? Irrational belief in myself, determination and commitment, and an incredibly supportive team. I am sure there were times when they felt major concern about the overall success of the team because everything that could go wrong for me with my body seemed to. My result would impact them, yet they persisted, worked with me, encouraged me, and at the end of the event we did cross the line together. It was a potent experience. I did achieve what health professionals and others had said I could not do in the time I had available. The event was not easy. It did pose its challenges, but I always knew I would succeed, and fortunately did not have to deal with lessons associated with failure. So what seemingly impossible endeavour or insurmountable problem are you engaged in or going to be? What resources can you draw upon (people, knowledge, techniques, tools) that can make a positive difference? What negative elements can you offload so they do not hold you back? How can you communicate objectives, seek commitment and garner support that builds on and extends a shared concept of success, value and possibility across the stakeholders? Success comes from knowing what you want, committing to it, and always getting back up. Getting back up is motivated by finding reason to. A leader builds ownership of the reason among their team and stakeholders. Together the impossible may become possible. Personally and with your team, make a commitment, honour the commitment, and DO IT. Do something impossible. 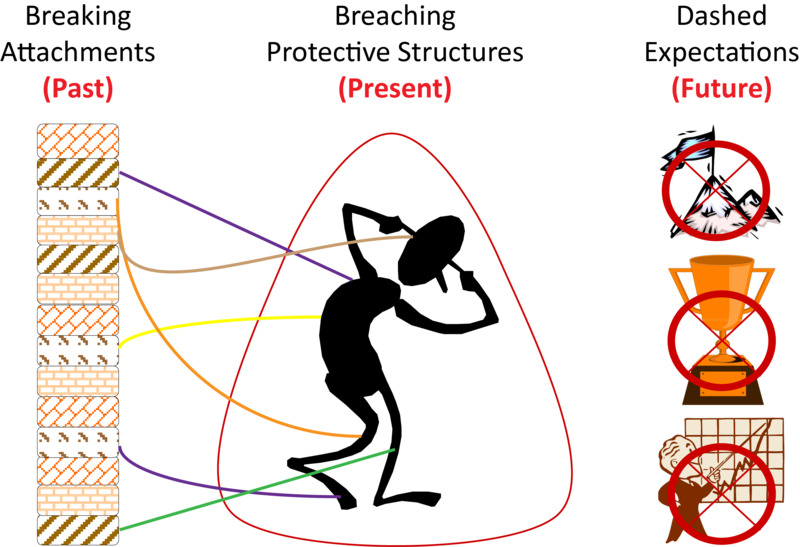 Consciousness refers generally to the state of knowing or awareness an individual has of their external surroundings, their own inner processes, and how to behave in a normal manner. From birth we each pass through developmental stages which are linked to changes in our levels of consciousness. Mastery of a new level of consciousness requires time, effort, and a fumbling or settling in period – mistakes are essential to the transition. Frustration is the common state or feeling that initiates the transition to a higher developmental stage. Through frustration we recognise the inadequacies in our current approach, and our inability to manifest our ideas or desires easily. We encounter many barriers and much resistance that halts or impedes us. Organisational consciousness parallels that of individuals. The level of consciousness for an organisation is based on the effective functioning and alignment of each of the following four aspects of the organisation, and is the responsibility of the leadership of the organisation. The Ends or ‘vision and values’ of the organisation articulates WHY the organisation exists. Through Organisational Leadership specific leadership practices, governance, planning, and communications define WHAT will happen WHEN. Sound management of Personnel enables the WHO to act effectively, while the Means of the organisation, including facilities, process, systems, policies etc define HOW things are accomplished. I am sure we have all observed organisations thwarted by inadequate or ineffective practices, which gradually (or quickly) overwhelm through the growing number of crises. The typical response is to treat issues in isolation, viewing them as individual and discrete. Fire-fighting mentality takes over with each organisational group responsible for fixing their problems, applying organisational first aid. Frustration is a common feeling throughout such an environment. The organisation must shift its level of consciousness and discover a new way of operating to achieve greater effectiveness. Executive and senior leadership must lead this. 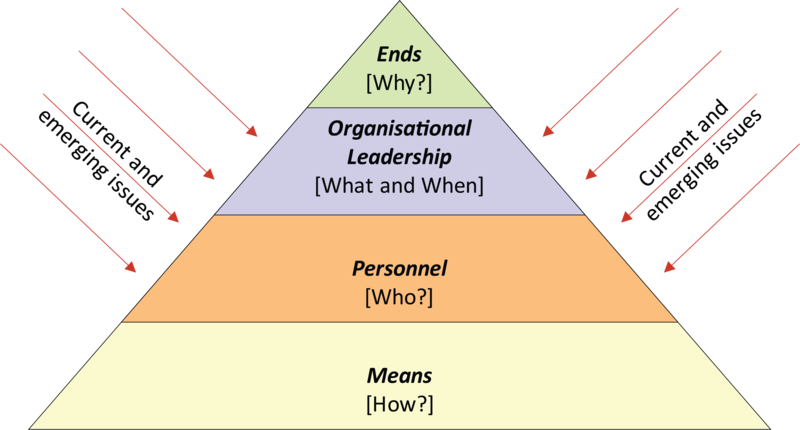 It starts with the Ends and must move down through the other organisational aspects – organisational leadership, personnel, and means. Vision and courage on the part of the leadership team is essential to shift organisational consciousness. As a result, those who work for, with or belong to the organisation will have a changed awareness of the long-term purpose of the organisation, what their specific function or role is within that purpose, and why and how goals are pursued and success is measured. Organisational consciousness has been raised. New mechanisms and measures for operating exist, and everyone affected is aware of the shift. This is more than just a change project. It is change that engages everyone and necessarily includes culture change. Shifting organisational consciousness does not merely critique and focus on the methods used to achieve goals. It examines the goals being sought. It changes culture. It enables new ways of operating. It sheds the old and invites the new. It is a powerful journey, an awakening, and requires the courage of all involved, but most particularly and especially of those who lead the organisation.